Arizona Professor Predicts Climageddon in the Next Eight Years | Watts Up With That? Arizona Professor Emeritus Dr Guy McPherson thinks the world could end in the next eight years because climate change. A SPIKE in devastating natural disasters is on the way as the planet has exceeded a “tipping point” for climate change, a leading scientist has claimed. The east coast of the US continues to be ravaged by a freezing cold snap while the other side of the country has been hit by wildfires. These are a signs of the times according to one professor, who says that the situation will only worsen in the next few years. Dr McPherson said: “The latest unprecedented hurricanes, earthquakes and wildfires that we have seen in 2017 are examples of profound changes in our climate system. “These global disasters threaten energy systems, infrastructure and food supply. “We have entered an era of exponential climate upheaval with tipping points and feedback loops pushing us over the edge whilst, all the while, governments and climate research bodies refuse to accept the gravity of our situation. “Within the next eight years, Earth’s temperature will approach or exceed its highest temperature in the last two billion years. Guy McPherson’s public views are so extreme they attract criticism from other climate alarmists. But McPherson is not alone in making extreme predictions; James Hansen, former director of NASA GISS, also predicts the world will soon become uninhabitable due to runaway global warming. If climate models predict runaway global warming, when will this predicted runaway warming actually occur? The answer is never, at least not for the next billion years or so. The Earth’s geological history is strong evidence that model based predictions of runaway global warming are nonsense. During the Earth’s history, CO2 levels have exceeded 7000ppm, 17x higher than today’s CO2 levels. Many of these periods of elevated CO2 were actually quite cool (see the top of the page). 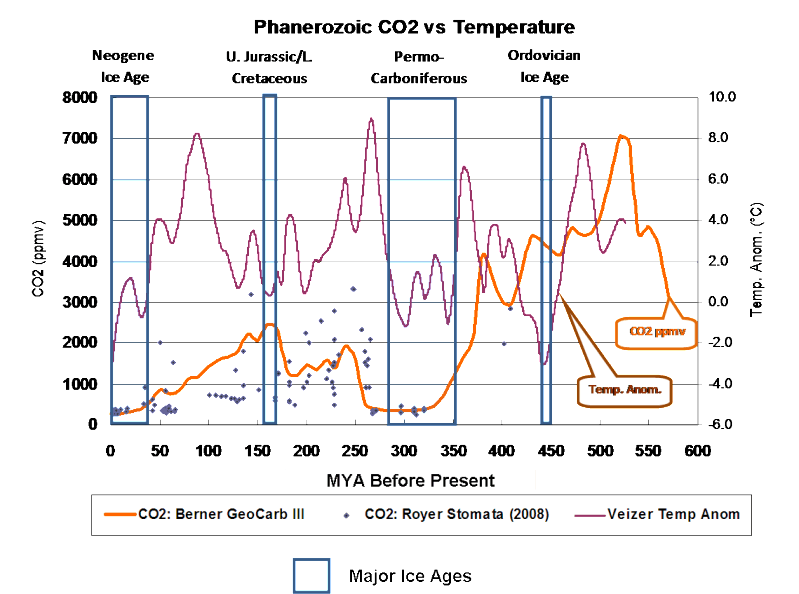 The Cretaceous, the age of the dinosaurs, experienced CO2 levels 4x higher than today – but the global temperature was only 4C warmer than today. No runaway warming occurred, despite dramatically higher natural CO2 levels and global temperatures. If the model projections of runaway warming implausibly contradict geological history, clearly the models are wrong. There must be climate forcings at work which have been omitted or incorrectly handled by climate modellers. The most likely candidate in my opinion for why model projections have an implausible tendency to run away from reality is the poor handling by climate models of clouds and tropical storms. Clouds reflect sunlight back into space, but storms go a step further – they actively pump accumulated heat from the surface back into space. Willis has produced many excellent posts about storms as heat pumps, such as How Thunderstorms Beat The Heat. Willis’ posts include data analysis which clearly demonstrate how tropical storms cap the Earth’s surface temperature, regardless of any additional greenhouse forcing. When Dr. McPherson and James Hansen provide apocalyptic warnings about the consequences of global warming, in my opinion they are just being honest about the projections of their most extreme climate models. 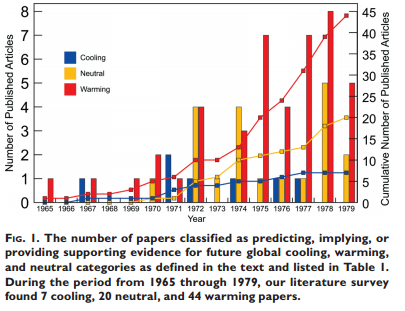 It is the model predictions themselves which are wrong, because the climate model predictions on which those warnings are based are inconsistent with the Earth’s geological history. Update (EW): fixed a typo (h/t Jim Masterson). January 8, 2018 in Alarmism. He must be needing new funding. The cold snap was an aberration but the fires were largely caused by excess precipitation and eco-greens messing with fire control methods. Since the fires balanced the cold snap it would appear they’re offsetting, not cumulative conditions. Last information I saw on wildfires, the majority are caused by the carelessness of people, not nature. “When Dr. McPherson and James Hansen provide apocalyptic warnings about the consequences of global warming, in my opinion they are just being honest about the projections of their most extreme climate models. Which models predict, er, forecast greater wildfire frequency? McPherson is drama queening while using alarmism rhetoric and hearsay from his infertile brain. He’s just another climatic ambulance chaser, running in to stamp every significant weather event with the mark of human ruination, and then project doom from whatever soapbox they can muster. Looking at the graph, he seems to be predicting 11 degrees C of warming – within the next 8 years (and the graph doesn’t show the full 2 billion years). If McPherson is not flat out lying, then he’s just plain CUKOO! Love the illogical “latest unprecedented”. Especially considering that none of the weather activities he is talking about are “unprecedented”. Those who cry wolf constantly hear new and different sounds of them from afar. Don’t you hate predictive spelling? Good One Bittertwist!. The propagandists have been a little under the weather so far this winter. An unintended but applicable and appropriate noun, when used in reference to climate dictators. They need it badly. Whatever medication he is taking – I’d like some for Friday night! The latest unprecedented hurricanes, earthquakes and wildfires that we have seen in 2017 are examples of profound changes in our climate system. Given all this, I think that “emeritus”, in this instance, should be spelled “i-g-n-o-r-a-m-u-s”. And the news agency publishing this crap should be cited for marketing false information. McPherson is a fool ! The world is going to end in seven years. My calculation uses no computers. You can’t double check computers. Where does he come up with eight years? Probably pulled the number out of a hat. Or maybe two feet lower. Knows how to get attention though. He’s trying to fart two feet ‘igher than ‘is arse. Eight years is probably a P.O.O.M.A. number, that is, a preliminary order of magnitude approximation. Don’t laugh, these people have a complicit media on their side. And they will push anything that saves their face. Paul, honey, I’m spending my retirement in creative endeavors along with trying to find out if any new and previously unseen birds will visit my feeding station. What are you doing? I read that and was wondering what type of ‘scientist’ he was. His article reads like a believer in Gaia like. I can project to this dude the idea that “Gaia is mad and the world for humans is at it’s tipping point and we are doomed” all while using normal weather events at proof. But now I get it since his CV starts with ecology and ends with evolutionary biology with a ‘fixation’ on extinction events. This guy has at least an excuse for his religious belief. Hanson has less of an excuse. Since he’s in Arizona, sounds like the guy has been pickin’ and eatin’ some of those “cactus” buttons out in the Sonoran desert. In plain language, he’s trippin’. Sooo you think we’ve reached a tripping point??? Probably near Phoenix, a graduate of Astrological Institute, an accredited school of upper education. They even teach you how to use computer models to predict your fate. So many similarities to climate science that I suspect a strong connection. I wonder if all astrologers predict we all die in eight years? That would be the final proof. 2026. I wish he’d predicted the day so I could stand outside and watch the world come to an end. Instead, I’ll have to look out the window every morning to see if it’s still there. Oh, wait, I kind of do that now, except I’m looking for snow. I love snow, and I’m retired, so I don’t have to go out in it – unless I want to. And I always want to. Drive in it (slide around in it), make snow angels, snowmen. Fortunately, I live in the country, so only the neighbor’s dogs notice me. Just who says he is a “leading scientist”?? Sees a large crown with pitchforks. Is this guy the director of Biosphere 2? Or has he just been out in the sun too long? What happens when you stand ankle deep in bullspit too long. Especially in the desert. We’ve reached a tipping point of idiot academics. Excellent! I may not always cite you, but I will quote you! As long as the royalty checks keep coming…. Back in the day, guys like this used to just wear or carry the signs saying “The end is nigh” and let it go at that. Now they just see end-of-the-world signs around every corner. And people questioning Trump’s mental health believe this . I like the CO2-Temperature graph. Although, if I did it again, I’d leave the Jurassic-Cretaceous ice age out. David, I was just going to say that, I’ve dealt with him before. I don’t think I’ve ever seen such a definitive Google result before. The guy appears to write an “end of the world in 10 years book”… every year. Nah It’s just a Griff sockpuppet .. remember the artic sea ice has all gone. What is truly scary about this story is this crackpot has a professorship and presumably tenure at a real university. Sounds like he met some resistance. In university speak, means he is out to pasture — with a mighty thank you from the school’s board of regents. This may be an honor, or it may be of the sort “thank god and Greyhound” he’s gone. Of interest is that in the Roman legions, when a person was no longer useful he was pushed aside — emertitus. My Latin was brief and I didn’t learn much more than Luna meant Moon. Perhaps someone can explain this better. It sounds like he was indeed pushed aside. Yes and he assumed the troll identity Griff on WUWT. * ended, finished, no longer in (mlitary) service. Veteran. Emeritus? I’d say closure to an emu. First cousin of the ostrich. the rest of his audience were in Church and he was a visiting Prelate. them into such action, I chose to be civil and let him alone. “the methane hydrate trigger has been pulled.” Eh? And it’s too late again! This time we’re all gonna die in eight years time! bases his assertions on solidly grounded evidence, evincing True Scholarship. Yeah we need more meddling kids. In person he is quite Gneiss. Allbeit dumb as a box on Gneiss. It’s panic time for the doomsayers. They know the AMO will be turning neg in the next few years, and then the jig will be up. rh you overestimate their knowledge if you think doomsayers even know what the AMO is!! Nothing unprecedented about the latest hurricanes or wildfires and… wait for it… earthquakes!!! LOL. Bring on the full tilt ridicule. Well deserved. That caught my eye, too. I don’t remember hearing of any earthquakes in 2017, and I still haven’t heard an explanation of how earthquakes are caused by climate. Yes, Valley Fever will do that to them at times. I’m not worried. Aliens will save us. At least, predicting the end within 8 years means he gets to see whether he is right or wrong. I wonder what he will feel in the latter case. Of course, and on the other hand, Hansen is well practised in seeing his predictions fail! I doubt he’ll even notice when his predictions fail. He apearntly was predicting the collapse of civilization in ten years from Peak Oil back in the early 2000’s. By 2025 he will have latched onto whatever the new Leftist scare is, like most of the Climate Faithful. And on and on. I wouldn’t worry–Oprah is supposed to be the next president! You forgot exploding silicone breast implants. Could poke an eye out ! He’s breaking the basic laws of doom-mongering. The apocalypse should be sufficiently close to be scary. But it should be sufficiently distant so that when the time comes everyone will have forgotten about it. You mean we only have to fund this drivel for another 8 years? Replacing “along” with “alone” would make more sense. Never have so many humans, over 7 billion, been this close to extinction. Oh right, from eating too much and exhaustion from all the crop yield gains. Or it’s the beer joint in Tucson with nothing else to do. Does he put. up any actual proof or is he just trying to scare the population . There is no proof that Co2 will cause very much warming at all . The global warming is just a theory that rely s on positive feed backs as the of doubling CO2 can not raise the worlds temperature more than 1.2 C.on its own without positive feed backs to amplify warming and these people know this is true. Here are a few trivial facts . The hottest temperature recorded at the south pole was -12.3 C .so its going to be along time before there is any melting there. .
He’s the academic equivalent of a troll. He says silly things, and the internet quotes/reviles him. He doesn’t care which, as long as he gets the attention he is starved for. He can’t get it based on science, so he says ridiculous things. How people like this guy gain standing as an expert in anything is beyond comprehension. I guess you need to be this loony to buy into junk science and the loonier one is, the more junk they blindly accept. Oh well, too late now. Might as well enjoy the V8 while I can. It’s not too late. You’ve got about 8 years but get your purchase in quick. Why stick with a V8 when you can get a V16 that will go in to a Bently? A V8 does have a distinctive note though. Mind you, so does a Merlin……..
From 15s to have an involuntary shiver go down the spine…. The Merlin was a fantastic engine. The best of the best water cooled in it’s era but IMO nothing matches the sound and feel of those round air cooled Radial engines and the 18 cylinder Pratt & Whitney R-2800 double Wasp was the king of those type engines in the WW II era powering the F6F Hellcat, F4U Corsair, and P-47 thunderbolt. Jones, that video has a redundant title. There is no such thing as a ‘Not’ Great Sounding Merlin Engine. I followed his link and surfed over to Rational Wiki. He also claims that he was under surveillance by the NSA when he was teaching and was nearly assassinated to avoid spreading the truth. In 2007 McPherson predicted the USA’s trucking industry would collapse by 2012 due to peak oil, quickly followed by the interstate highway system. In 2017 he predicted that global temperatures would be 6 C above baseline in mid 2018 and that Earth would have no atmosphere by the 2050s. I’ve learnt how to forage locally, it’s at my local supermarket which I get to by my petrol car and I love it – modern life is wonderful and we just have to ignore the green doom mongers who wNt to destroy the health, happiness and progress made in th3 last two hundred years. Hmmm… the guy is 57. So 57 + 8 = 65. Under the Arizona State Retirement System, the retirement age is 65 years. He is retired now. He is a Professor Emeritus. Don’t know about AZ, but I’ll guess there really isn’t a university retirement requirement by age, and certainly not age 65. That’s a useless number that came via railroad workers and got cobbled into US Social Security. Even therein it is mostly historical. Anyone that needs proof that the MSM is biased to promote that use of fossil fuel causes “Climate Change” needs to read this. I object to the notion that “scientists” are only agreeing with the model output, and not the model. BS. I hope the lunatic Left continues with these hilarious apocalyptic climate predictions as they will just cause the blowback against the Left to be that much more epic once the CAGW ho@x is laughed at in about 5 years after global temps show a cooling trend from: the PDO/AMO both being in their respective 30-year cool cycles, and a 50~75 year Grand Solar Minimum starting from 2020. From wiki :- In May 2009, McPherson began transitioning to living on an off-grid homestead in southern New Mexico. If he is so worried about climate change surely it would be more appropriate to live off grid in Alaska wouldn’t it? Wait a minute; hotter than any time in the last 2 BILLION years? Even hotter than during the Permian Extinction, when the Deccan Traps exploded in volcanic fury? Even hotter than when the asteroid collided with Earth to fry all the cuddly little dinosaurs? we’re even nowhere near the Emian interglacial temperature nor the Holocene optimum temps…. all Paleoclimatology reports show that the holocene is a less spiky one of the colder interglacials of the last 400000 years…. Predicting things eight years out is really foolish. Both you and the people who heard your prediction are likely to be around. Skillful predictors always put off doomsday until some time when they and the audience will be safely dead. A century out is usually pretty safe. Not all predictors push it way out there. I remember during my college years a preacher predicting the end of the earth. It was the same day as my best college buddy’s wedding. He was hoping the rapture would be put it off until after consummation. I think that was in August 1976. There was no rapture. The preacher came on the radio and apologized to his listeners. He said he had demonstrated extreme hubris in predicting a date the Bible explicitly said could not be predicted. As a result, he was leaving the ministry and radio… and I haven’t heard of him since. An honest preacher. A member of the 1%. Maybe. 8-years from now? Bad choice! Should have been 2099! No one alive now will be alive in 2099! Ergo no law suits! Bite your tongue. My 18 month old grandson will be 83 years old in January 2099. I would pick an out date of 2040. Nuke the Chinese and Indians? Sentence all coalmine directors and shareholders to death? Sorry what was that . . .
Ok doc we’ll get straight onto it . . . LIES from the very first !! while rising carbon dioxide concentrations themselves could be reducing the nutrient content of crops on a global scale. completely ignoring the fact that this is based on an increase in actual food because of increased CO2. Anyway, we’re all gonna die! LOL, reminds me of the crazed religious folks, bless their hearts who are so scared they will miss the Messiah that they end up taking their own lives. Zealots for sure but damned deceived for sure. Our planet has the ability to heal itself. Carbonphobes are religious folks. They are following their own peculiar form of pantheistic gnosticism. Trouble is they arent really unpredecented are they. This numpty should have learned to push his predictions of doom out a bit further from his alarminista buddies. 8 years will go by quickly and he will look as silly as Gore, Flannery, Mann et al do with their predictions of doom. Every time I raise the CO2 was higher in the past I get but the sun was weaker then. My answer has always been “but I thought the sun had nothing to do with it”. That old CO2 was natural. Nature is Good. This is Capitalist CO2. It is Bad. I know it’s not polite, but all I can do is point and laugh. He breezed through NZ a couple of years ago. Looks like we Kiwis are the last to be exterminated. I might try running a B&B for all you Rich Northern Hemisphere folk. Send $$$$$$$ now and I’ll keep a room free for you. Might take you up on that, Maggy. I’d like to see Mt. Cook near sunset with clouds floating through the valleys between Cook and the other mountains. Makes it look like you can see into forever from that spot. If people just stop paying attention to Musk, he will fade away. Ditto the rest of these crackpots getting attention in the media. Both are religious beliefs and unfalsifiable. Think it’s been tough? Try running a complex civilisation outside a cosy little interglacial like ours. No-one’s tried that yet. This is so bizarre – topped off by his linking of climate change to earthquakes – that one wonders if this Arizona prof might be stressed, or maybe distracted. His predictions are sensationally alarming. If he is wrong throw him in jail for public mischief because uneducated people, and some more educated as well, believe what he says and may take silly action for no reason at all. Good news! We can ;now cut all funding for climate science. It is too late to make a difference. PARTY! Maxing out the credit cards and reverse mortgaging right now and I have lots of bridges up for sale online going for a song. They’d want to cut the funding for climate science pronto because what dopes would be paying taxes with thermageddon nigh? One thing’s for sure. When you’ve been tipped off as often as I have like this I’m not tipping anymore. Dontcha just love those blow up vinyl ‘floaties’ he’s wearing on his arms? That’s what the WWII generation of mums and dads used to put on us as tackers to go swimming and compare that with the bedwetters and nanny-staters of today and their machinations. He seems to be a real life version of the Nutty Professor. Now I don’t know the Prof but when is his retirement? 8 yrs from now? I’m old enough to remember the World’s Entering New Ice Age scare(s) of the 1970s. They were real. Whole learned articles appeared in Scientific American, New York Times, in atmospheric and climate journals. Encyclopedia Britannia, Comptons, other majors had both main-book articles and their “Science Year” summaries proclaimed near-near future famines, doom. Ice ages. I’m also old enough to remember all sorts of other bûllsnot: the aluminum pan scare – it’ll give you Alzheimers (it doesn’t); the cranberry scare – they’ll give you hepatitus or something (it doesn’t); or in 2008 the Great KillerTomato scare. No one would serve ’em. Turned out to be green peppers. Oops. 2006 Organic Spinach scare. 2001 West Nile Fever scare. $200,000,000 spent. No one got the fever. Killer Bees. Radon Gas. SARS. Seat Belt Conspiracy. It never stops: The Media knows in its gut that fear fear! sells eyeballs. Sells talking points. Things for people “in the know” to talk about FIRST, that everyone following slavishly hops on board. Remember Y2K crisis? Wait… what crisis? Remember post 9–11 across the land for months, the posted Army troops leading to major bridges? Or for months the Air Force escorts (2 of them!) for every incoming international airline flight? I’m not saying that “we should do nothing” when bonafide problems, issues, “scares” turn up. Who knows – since we read history, it is certain that the 1917 influenza pandemic with a massive killer. Some QUITE real. 1969 Hong Kong influenza… greater than 1,000,000 worldwide perished. 1957 Asian Flu … over 2,000,000 worldwide. The millions killed in the 9 Cholera pandemics. Plagues, measles, smallpox. Sure BIG SCARES are seriously to be alert to. But… some are just silly. The present day “tipping point crisis” is just one such. There is almost no evidence that the world “tips”. Or… if it does (and it certainly did when it came out of the last Freez-o-cene), or the Little Ice Age … when it does decide to flip – mankind, no matter how much we tend to fret, seems to NEVER have been the root of any of it. Pandemics, yes. 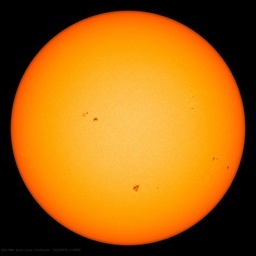 May have been real but outnumbered by studies predicting warming. So the media found them nice and sensational. “Ice Age cometh” will do that. Only according to Wikipedia vandal “Stoat” Connelly. Those of us who were around at the time and had access to the scientific literature know different. You left out the Zika virus. Now it’s found to have potential benefits for eliminating cancerous cells in brain tissues. I am curious to the absence of their forecast. They see, in 8 more years, the beginning of the end, yet they could not see, 2017-2018; fires and floods in California, while at the same time, historical cold and snow on the East Coast. The Prof has clearly been reading the Guardian too often (once is too often!). You may know that the Guardian is in financial difficulties and that its print run is the lowest since the pre-Cambrian. Most of these are bought by the BBC as a sort of not-very-well-hidden state subsidy. How one of these valuable copies got to Arizona is a mystery, and probably a cause of climate change. By coincidence I recently read that at the present rate of losses, the Guardian will run out of money in exactly 8 years time. So we will have something to celebrate in thermagedon. Get the champagne in. It would be interesting to get this Guy McPherson that predicts a thermageddon pronto, and Valentina Zharkova that predicts a mini-ice age any time now, in the same TV show. The audience would be thrilled. Great popcorn time. The original intention and starting point of the Paris agreement is good, encouraging people to low-carbon and green development, without any mistakes in itself. However, I am 25 years old, and it is possible that my life will be spent in fear. If these things do not happen when I am old, I will definitely take the following actions. 1: find the professor’s grave and pull out the whip. 2: find the body of the former NASA administrator and whip the corpse. 3: bringing the IPCC to the United States federal court, I think they are guilty of more crimes than the nazis in world war ii. I hope he’s prepared to eat crow. What DO you have against crows????? A question to ponder …………. Does anyone know of any other person, other than myself, who has ever considered the possibility that “The Age of the Dinosaurs” (Cretaceous Period) ……. came and went …. simply because of the fact that ……. “4x higher CO2 levels” and “4C warmer surface temperatures” ……. also came and went? High atmospheric CO2 levels and warm surface temperatures = great “green” biomass growing conditions. Great “green” biomass growing conditions = tremendous increase in herbivore body sizes and populations. Tremendous increase in herbivore populations = tremendous increase in prey animal body sizes and populations. And then the warm surface temperatures started decreasing and the atmospheric CO2 followed suite. And the rest is fossil and geologic history. Because a large asteriod struck the Earth during that time. And TA, there is absolutely no way to prove that the asteroid “strike” particulate actually “blocked” solar irradiance, …… plus the fact that the Deccan Traps volcanism most probably put 10X as much particulate into the atmosphere than did your cited asteroid strike. You left out the part about the predators of the Big Herbivore (down, Dinny! Good boy!) increased in size along with the increased size of their prey. Was it cause and effect, or was it effect (enlarged herbivore size) and cause (enlarged predator size)? Sara, ….. HA, …… it matters not which way you state it. Cause n’ effect ……. or …… effect n’ cause, …… the end results are the same. Great quantities of easily accessible and highly “nutritional” food sources is a primary “driver” of plant and animal body size. (which is also the cause of present day human obesity problems). And Sara, it was those …… “great quantities of easily accessible and highly “nutritional” AQUATIC food sources” that was the “driver” of the evolutionary changes in a member of the Family of Great Apes, ……. the species known as Homo sapien sapiens. Thank you, Sam. Much better reference there! He is wrong. Those in the know realize that Apophis is going to hit the Earth in 2036 and that will end it all. Fortunately I will be so old I won’t realize what is happening and won’t care. No, no, no. The Space Needle that just passed through the solar system was a warning that Planet 9 (Erda or something like that) is going to yank Earth and change its orbit just enough to make Earth leave the Solar System behind. Try to keep up! According to this link provided by John Hulquist above, the number of Magnitude earthquakes 4.0 or greater has been less every year, from 16,674 in 2014, to 12,527 in 2016. How is that unprecedented? ‘Fewer in the historic record than e-vahhh before’ [since 2014 . . .]. McFearsome needs to get a grip on reality. It’s always curious what motivates people to become so apocalyptic in their pronouncements. It’s one thing to have nagging worries about the future, quite another to obsess over it. McPherson has not learned the most important lesson of Climate Science; never make an unfounded assertion on a timeline that expires before you do. I’ll have to add that one to my tag line file. He’s obviously not running for office on the scare monger ticket with that basic mistake. Similarities to Syria are striking. Even the worst drought years more than doubled food production of the 1960s, but population more than tripled. Neither government is willing to take money out of the oppression and terror budget to fund water/agricultural projects. Maybe Australia could sell them some slightly (if at all) used desalination plants. I wonder if Iran is like a lot of the Middle East where the first 5000 years of desertification were natural, but the last 30 are caused by CO2. If it’s too late to do anything, can we go ahead and defund the alarmists now? Is defunding someone not “do anything”? from the government standpoint defunding something is more work then funding something. Don’t send your kids to that bastion of climate cult faith. I can’t think of a single person in history who became popular by predicting that the future is going to be just fine? All the complaints about about these nutty “scientists,” and politicians, will make them go away, nor will using reason to refute them, make them stop, unless a huge legal action is taken against them that strips them of money, and position. Lock up Chicken Little and end “The Sound the Hare heard,” once and for all. This is no different them other kinds of fake science, preying on human society. Strip them of all credibility by making it a criminal charge to teach lies. We have come so far as a species. In the mid 1600s we burned women as witches to improve the weather. Now we are going to burn SUVs. All the complaints about about these nutty “scientists,” and politicians, will not make them go away, nor will using reason to refute them, make them stop, unless a huge legal action is taken against them that strips them of money, and position. Lock up Chicken Little and end “The Sound the Hare heard,” once and for all. This is no different then other kinds of fake science, preying on human society for gain. Strip them of all credibility by making it a criminal charge to teach lies and collude to do so. On the contrary, the more insanity and the louder rant makes them irrelevant faster and undermines anyone and any idea associated with them. It works like that in long election seasons also as the deep cracks of personality flaws and purpose come out. The megaphone holder is the last one to recognize this and the same goes for the media props that amplify it. In any other line of inquiry, yes. Rotting from the inside out is sometimes hard to spot. Just ask the Soviets, Saddam’s defense ministry, and Vatican bankers. Is this McPherson fellow trying to form another one of those cult groups so that he can talk people into living in an enclosed compound and lock the gates, or into murdering people in mass quantities? Who else has done that? Oh, yeah – Jim Jones – Jonestown. The Heavens Gate group waiting for aliens to come and get them. Maduro, down in Venezuela. The Kims, since the truce that stopped the Korean War. Mao Tse-Tong. Pol Pot. Ho Chi Minh. Lenin/Stalin. Hitler. And those are just a few. Seriously, I sometimes wonder if maybe the Amish have been smarter than the rest of us. They already know how to do everything from scratch. They probably know more about soil, weather, and crops than any of these geniuses who get grants and preach “doom on you” to gullible audiences. I have seldom been as disgusted with con artists as I am now, and that’s ALL these climate yo-yos and hysterics-promoting twits are. Air cargo shipments are soaring due to surging demand for rapid delivery of everything from smartphones to paper towels. As online shoppers come to expect faster home delivery, passenger jets and dedicated cargo planes are picking up more kinds of cargo traditionally carried by container ships, trains and trucks. Global airfreight traffic climbed almost 9% year-over-year in November as a jump in e-commerce orders supercharged the holiday rush, according to cargo data provider WorldACD. Rates for airfreight were up 17% annually that month. Strong global economic growth also is spurring demand for goods long ferried by air, such as automotive and manufacturing parts. The dual surge is creating some of the stiffest competition for air-cargo space in years, and prompting companies to search for older, idle jets to convert into freighters. Hasn’t McPherson been warning 10 year extinction for 10 years? What, in only eight years? Does this guy who predicted this have some terminal disease that will kill him before that? Oh, wait…I forgot…being completely wrong about predictions in the field of your life’s work is consequence free in climate science. Department of Ecology & Evolutionary Biology, In 2009 at the height of a productive career, McPherson left the university to prepare for collapse. He now lives in an off-grid, straw-bale house where he puts into practice his lifelong interest in sustainable living via organic gardening, raising small animals for eggs and milk, and working with members of his rural community.